Today, I am sharing a recipe for a spicy concoction in Indian style. 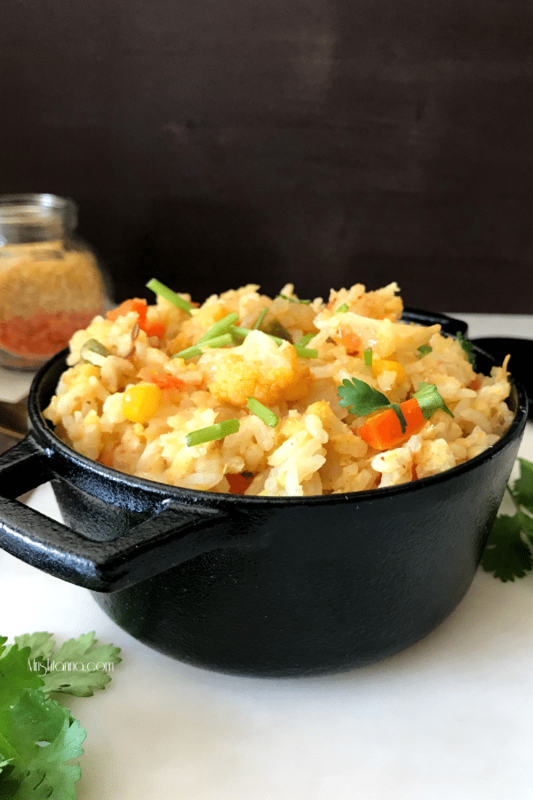 Learn how to make Masala Khichdi using an Instant Pot with the help of short video and detailed step by step directions. This nutritious one-pot dish is a combination of rice and lentils, vegetables and some powerful spices. Khichdi is a healthy and nutritious option that is packed with protein and a host of nutrients. You can prepare it with or without the spices and either way, it is one easy to digest vegan, gluten-free, soy-free, nut-free recipe that fits well for any age group. When I mention vegan, the question I am often asked is if it is possible to make Khichdi without clarified butter a.k.a ghee? My favorite lentil for this recipe is Moong Dal. Plain rice and moong dal khichdi are best for babies. You can see the recipe for that in veg recipes of India.Â But I have used masoor and Toor Dal (Split Red Gram) in the past too. Regardless of which one you choose, the protein per serving is still pretty high. Masoor Dal (Split Red Lentil) adds a bright color to the dish and hence ends up being the most common choice. Hereâ€™s a fun fact…this popular one-pot meal is called by different names and with slight variations. Although Khichdi is the most common, it is also called as â€œkhichuriâ€. In the southern parts of India, it is known as â€œPongalâ€. The British call it â€œKedgereeâ€. If this recipe piques your interest, look for similar recipes in my blog such as the Cracked Wheat Khichdi. For more delicious vegan recipes such as this sent directly to your inbox, just subscribe to my newsletter. You will also get a copy of my e-book where I have put together some simple vegan dessert recipes and dessert essentials. My readers have found it very helpful and I am hoping you will too! 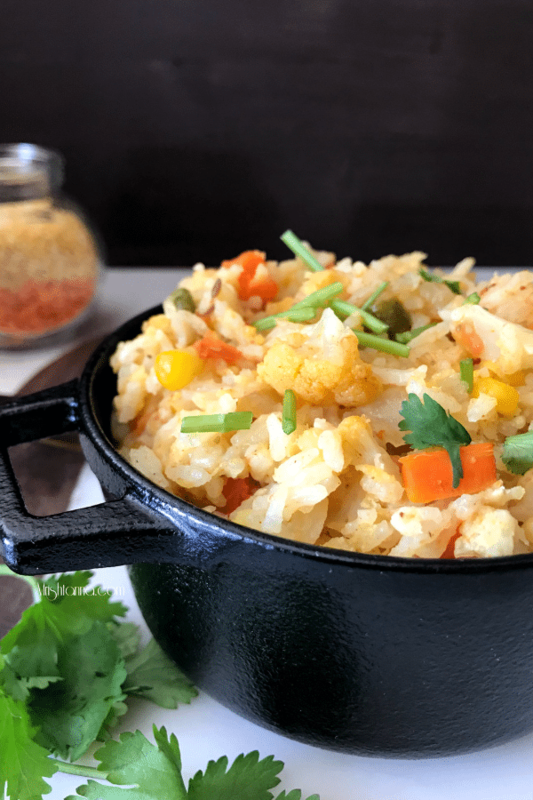 Learn how to make Masala Khichdi using an Instant Pot with the help of short video and detailed step by step directions. This nutritious one-pot dish is a combination of rice and lentils, vegetables and some powerful spices. 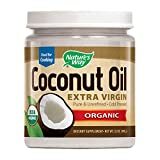 Add oil to inner pot in Instant Pot and press the sautÃ© setting. As the oil heats up, add cumin seeds. Follow up by adding onions, grated ginger, and green chilies. Stir constantly for a minute. Add tomatoes and continue to stir for at least a minute. Add all the spices and stir continuously for 1-2 minutes. Now add all veggies and salt and continue to mix them well to get an even coat of spices on the veggies. Add rinsed rice, lentils, (moong dal & masoor dal ) and water. Give it a good stir one last time. Close the lid of the instant pot and turn the steam release handle to â€œsealingâ€ position. Select the pressure cooking option and set the time for 7 minutes. When time is up open the lid using natural release. Instant Pot Masala Khichdi is ready! Mix and serve hot with your favorite chips or Indian pickles! I recommend these below products for Instant Pot masala Khichdi. Simply Organic - Coriander - 2.29 oz. I am a huge khichadi fan Uma and like to try different khichadi recipes. Thanks for sharing your recipe. Wat a wonderful,healthy and delicious one pot meal, prefect for lunch box. Looks like Instant pot rocks.. You guys are coming up with different dishes cooked through Ip. Well Done. 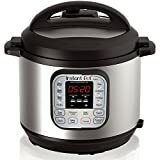 Using instant pot sounds like a easy and fuss free way to make a delicious dish. 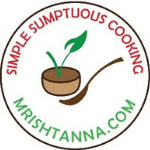 Thanks for sharing healthy kichdi recipe. 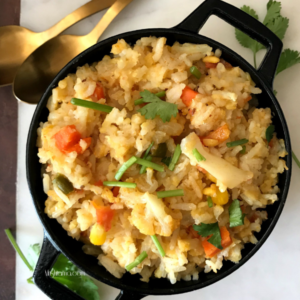 Masala khichdi is one of our favourite one pot meals…Never tried in instant pot though….Looks like it works great…Loving it!! Instant pot masala khichdi seems fuss free and easy. This is such a healthy one pot meal. One-pot meals are always the most opted ones at ours. Thanks for sharing a nice recipe that can be added to my list of healthy and quick meals. I love khichdi and this one looks super yummy. An easy and filling dish and this is the perfect time for this. Lovely share!